There are even attempts to contrast the newer proactive technologies with the older reactive technologies that use signature-based methods to detect malware and that require continuous and rapid updates of antivirus databases. The concept of proactive protection is, of course, extremely attractive: a virus hasn’t even appeared and already there is protection against it. But the question arises as to just how effective these technologies are. It should be noted that proactive technologies encompass a broad range of concepts and approaches, and including them all within the framework of a single test is simply not feasible. In this test we will only compare the heuristic components of antivirus protection (heuristic + generic detection, i.e., extended signatures), without taking into account an analysis of system events (behavior blockers or HIPS). The results of the test make it possible to say how effective a heuristic analyzer is and in which antivirus product this component performs the best. As an addendum, a final measurement of the detection level for the collection of malware samples was performed on the updated antivirus software a week after the main test. As a result, the quality of detection for new viruses, as well as the effectiveness of the classical signature-based method of each antivirus program was ascertained in addition to their heuristics. The results of the test make it possible to say how effective a heuristic analyzer is and in which antivirus product this component functions the best. Testing of the antivirus programs was performed on a Windows XP SP2 operating system from 21 October to 8 December 2007 strictly in line with the methodology for setting up the conditions to check the effectiveness of heuristic analyzers (the update function of all the antivirus products was switched off, i.e., the antivirus databases were frozen on the date the test was initiated). Diagram 1 and table 1 show the detection results for unknown malware by the different antivirus programs. The out-and-out leader in terms of the effectiveness of the heuristic protection component was Avira AntiVir Personal Edition Premium, whose detection level for unknown malicious programs was very high (71%). 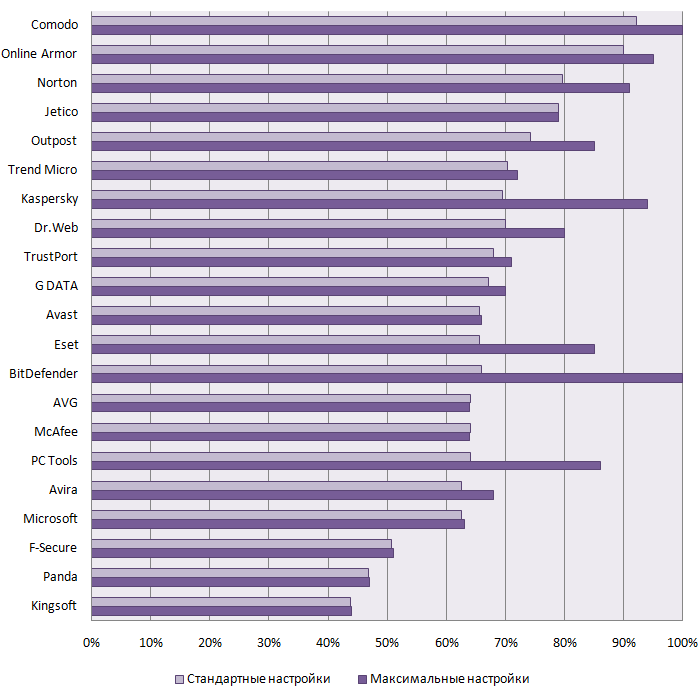 The BitDefender Antivirus heuristic analyzer was also very effective, detecting 65% of the unknown malware. Their results meant that both of these products received the Gold Proactive Protection Award. The heuristic components in ESET NOD32 Anti-Virus, Dr.Web, Sophos Anti-Virus, Avast! Professional Edition, VBA32 Antivirus, Kaspersky Anti-Virus, and McAfee VirusScan Plus all demonstrated a high level of effectiveness, ranging from 59% to 43% respectively. All those products received the Silver Proactive Protection Award. The first two antivirus programs from this group only missed out on the Gold Proactive Protection Award by 1-3%. Another 5 products – Symantec Anti-Virus, AVG Anti-Virus Professional Edition, F-Secure Anti-Virus, Trend Micro Antivirus plus Antispyware, and Panda Antivirus – all achieved satisfactory results and received the Bronze Proactive Protection Award. The only product to fail the test was Agnitum Outpost Security Suite, which appears to lack a heuristic analyzer. It managed a result of only 12%. Due to the fact that the new malicious programs were collected over a four-week period (from 5 November to 2 December 2007), it became possible to evaluate how the effectiveness of the various heuristic analyzers changed over time. This entailed the sample collection being split up into four equal parts, each representing a week. Diagram 2 and table 2 show data on the effectiveness of the heuristic analyzers for the weekly collections. From table 2 it can be seen that the heuristic component in Avira AntiVir Personal Edition Premium, BitDefender Antivirus, Dr.Web and Kaspersky Anti-Virus demonstrated the most stable levels of effectiveness throughout the period when there were no updates, while the effectiveness of the component in ESET NOD32 Anti-Virus, Panda Antivirus and AVG Anti-Virus Professional Edition fell significantly. The drop in the heuristic effectiveness of ESET NOD32 Anti-Virus over the test period can be singled out in particular. As an addendum to the test, a final measurement of the detection level for the collection of malware samples was performed on the updated antivirus software a week after the main test (8 December 2007). As a result, the effectiveness of the classical signature-based method of each antivirus program was ascertained in addition to their heuristic analyzer. This made it possible to see which role each of the components plays in the detection level for each antivirus program (see diagram 3). The diagonal line in diagram 3 denotes a 100% level of detection for new malicious programs. Getting close to the line can be achieved through the effective functioning of one of the components of antivirus protection or a combination of the two. Products in the dark orange (80-100%) and light orange (60-80%) zones demonstrated excellent and good detection levels of new viruses (aged from 1 to 5 weeks, see methodology). The majority of them – Avira AntiVir Personal Edition Premium, Dr.Web, BitDefender Antivirus, ESET NOD32 Anti-Virus, and Sophos Anti-Virus – attained that level based on the contribution of their proactive component. Kaspersky Anti-Virus and F-Secure Anti-Virus achieved similar results based on their signature component. The most balanced in this sense were AVG Anti-Virus Professional Edition, VBA32 Antivirus, Symantec Anti-Virus and McAfee VirusScan Plus, where both components functioned equally effectively (ending up in the lower left-hand square on diagram 3, while the overall detection level for new malware was good or excellent). Panda Antivirus achieved a satisfactory overall detection level for new malicious programs, but Trend Micro Antivirus plus Antispyware and Agnitum Outpost Security Suite were completely ineffectual against new threats. F-Secure Anti-Virus (98.2%), Kaspersky Anti-Virus (97.6%), Avira AntiVir Personal Edition Premium (92.7%), BitDefender Antivirus (86%) and AVG Anti-Virus (85.9%) turned out to be the best at detecting new malicious programs.